Refried pinto beans courtesy of Martha Rose Shulman’s recipe for refried beans. Cook onion and garlic in olive oil in pressure cooker (without lid), – I also include a fresh chilli as we like our food hot – then add beans, water, loads of fresh coriander/cilantro, salt, bring to boil and seal lid. Bring to pressure and cook for required time. 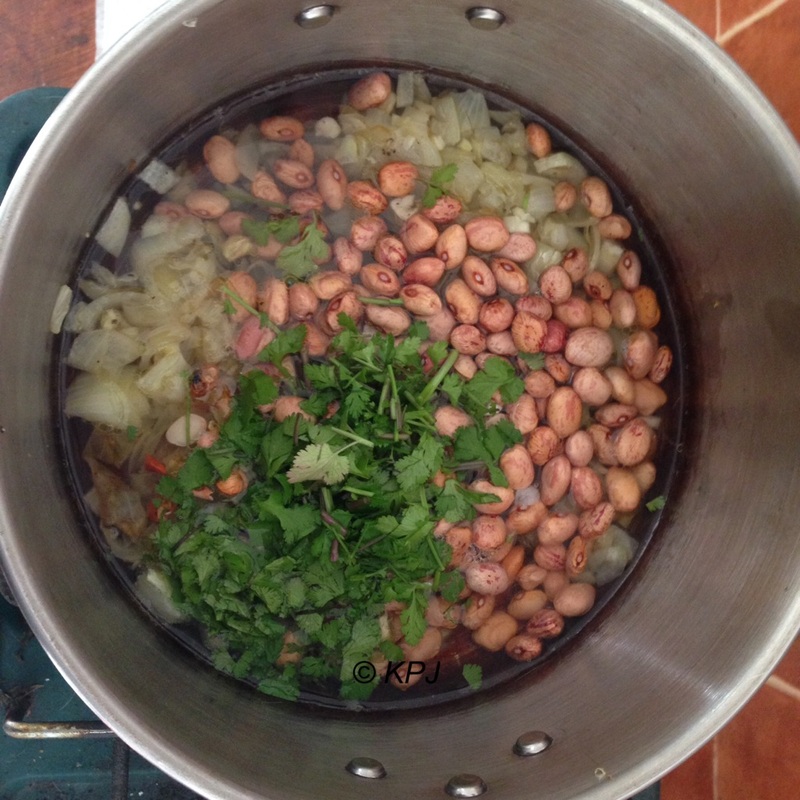 This depends on your pressure cooker and how fresh the beans are. I cook pintos for 25 mins. When they are cooked, add beans plus a little liquid to frying pan with olive oil, cumin and chilli powder. Cook gently, and mash beans while cooking. Serve with tortillas, guacamole and salad of choice. I bought four small avocados from our veg man, who delivers twice a week, for 85 cents. The kilo price in the village is nearly five euros. Our village supermarket does weekly specials and this week El Paso products had a 20% discount, so it was a good time to buy tortillas.